Grand Ledge is long overdue for some warm weather fun. 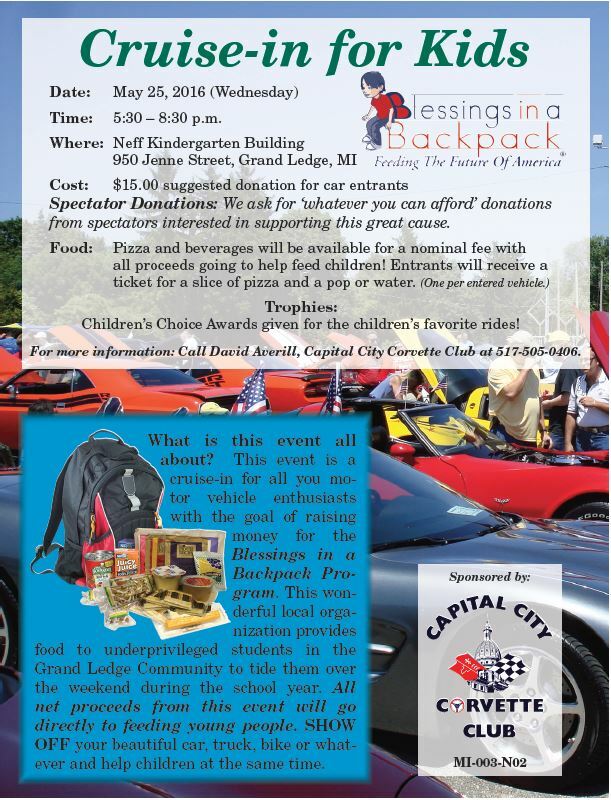 The Capital City Corvette Club is sponsoring the first big community event of the season, the 3rd Annual Cruisin’ for Kids car show fundraiser for Blessings in a Backpack Grand Ledge on Wednesday, May 25 from 5:30 – 8:30 just across the street from Neff Kindergarten Center. This is a great event for the whole family – especially the kids – who vote for the best of show. There is no charge for the public to attend the event. If you wish to enter a car, motorcycle or other interesting vehicle, there is a suggested $15 entry fee. All proceed from the event will go to Blessings in a Backpack. Rain or shine, we hope to see you there. Then on Saturday, June 4, the Caring Neighbor Foundation Golf Outing Fundraiser, a benefit Blessings in a Backpack Grand Ledge, will be held at Centennial Acres in Sunfield, Michigan. The event begins with lunch (included in the registration fee) at 1:30, and the tee off begins with a shotgun start at 2:30. The format for the outing is a four person scramble, of 18 holes, noncompetitive. Enjoy one of the first golf outings of the season and help the kids in the Grand Ledge area at the same time.